The export sector increasingly benefits from relocation of export-oriented industries away from China, due to Vietnam’s relatively low production costs. The Vietnamese Communist Party remains firmly in power, despite rising public discontent over the lack of personal freedom, government corruption and land seizures by the administration. While the leadership has tightened its grip on the civil society, economic reforms continue. The territorial dispute with China over conflicting claims in the South China Sea is currently not high on the agenda, but nevertheless remains a serious issue in the bilateral relationship for the future. In order to counter growing Chinese assertiveness, Vietnam is keen to improve its political and security cooperation with the US and Japan. However, despite enhancing its naval forces, Vietnam lacks the military capability to pose a serious challenge to any Chinese actions, and its manufacturing sector depends heavily on raw materials imported from China. Moreover, given the ideological similarities of the regimes in both countries, there is still a strong pro-China faction within Vietnam’s Communist Party. 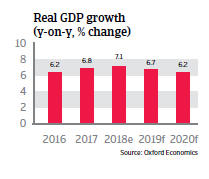 Economic growth is expected to remain structurally high (above 6%) in 2019 and 2020, driven by both domestic demand and exports. While high wage growth supports private consumption, economic policies to liberalise regulations and deepen global economic integration support business investments. Export growth is expected to remain robust. The export sector benefits from relocation of export-oriented industries away from China, due to Vietnam’s relatively low production costs, especially in the ready-made garments (RMG) sector. Vietnam is currently the world's third-largest exporter of RMG, with the share of exports to the US accounting for about 50%. However, downside risks have increased due to the ongoing Sino-US trade dispute and slowing growth in China. As an open economy heavily dependent on external trade, rising protectionism and/or lower global trade could have significant knock-on effects. The Vietnamese business environment is still hampered by weak institutions, infrastructure issues and corruption. The share of state-owned enterprises (SOEs) in the economy is high. Many of them are financially weak and inefficient, constraining productivity increases. However, the situation is gradually improving as the government makes (gradual) progress with deregulation, SOE privatization and anti-corruption measures. Strong points of the Vietnamese economy are its openness, diversified export basket, and low share of commodities in exports. High GDP growth and a state-promoted ‘bad bank’ have reduced non-performing loans, but the high reliance of businesses on bank borrowing has resulted in outstanding credit of 130% of GDP. The average capital adequacy ratio of banks has decreased to about 12%. While financial institutions are gaining strength via consolidation and foreign direct investment, they could struggle to meet the private sector’s investment needs in the coming years. The Vietnamese dong is expected to weaken gradually against the USD in 2019, due to a decreasing current account surplus, higher inflation and monetary tightening in the US. The central bank will probably increase official interest rates in order to support the dong. Strong devaluations are less unlikely than they were in the past. Vietnam's foreign debt has been fairly stable and well financed over the past couple of years. As a percentage of GDP, it is low in relation to export revenues (35% in 2019). Foreign debt mainly consists of government debt with long maturities and a low debt service. Despite improvement, Vietnam´s liquidity situation remains weak, as international reserves in months of import cover remain low at about 2-3 months, mainly due to high import growth. Foreign exchange reserves, however, are sufficient to cover the external financing requirements. 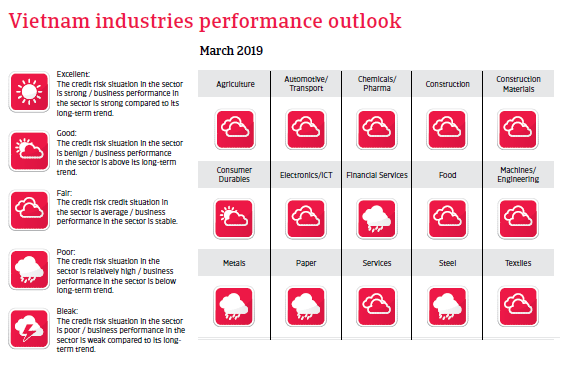 Despite increasing clouds on the horizon, there remain several bright spots for export opportunities in emerging markets.